 Johanningsmeier (History/Delaware) ponderously depicts Communist leader and three-time Presidential candidate William Z. Foster (1881-1961) as a ``thoroughly American radical'' whose journey through trade unionism and the Wobbly movement to an idiosyncratic Communism exemplifies the course of US radicalism. Foster, perhaps deliberately, said little about his early life in Massachusetts and the working-class Irish slums of Philadelphia, but the author explains that Foster's immigrant father infused his son with Irish revolutionary ideology and a hatred of authority. Deeply affected by the Philadelphia railway strike of 1895, Foster abandoned the Catholicism of his boyhood to plunge into radical politics, becoming a prominent union organizer and an eloquent soap-box orator. Traveling throughout the US and the world as a railroad worker, seaman, and hobo, Foster absorbed the literature of socialism and emerged, in the 1910's, as an effective labor organizer for the Wobbly movement and for the American Federation of Labor, particularly in the steel and meat-packing industries. Foster also became a leading advocate of ``syndicalism,'' a quasi- socialist movement which called for organization of production by unions. In September 1919, in what the author describes as his ``high point as a radical,'' Foster led a massive, though unsuccessful, strike of unionized steel workers, the failure of which led to the departure of Foster and other radicals from the mainstream union movement. By 1921, Foster was a self-professed Communist revolutionary, although still, according to Johanningsmeier, a ``free-lance'' radical who defied easy classification. The author follows Foster through his career as a leader of the Communist Party of the USA, his intra-Party conflicts with Earl Browder, and his runs for President. 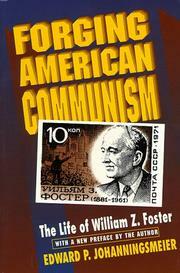 Foster went to Moscow in 1961 for medical treatment and died there, where he received a state funeral. Much ado about a marginal American political figure, important more for his early career as a labor organizer than for his later one as a Communist.